Before last week, I’d never made an Empire/Regency dress. Imagine that. I love the period, but for some reason I felt intimidated by them, which is funny, as I’ve made lots of far more advanced and complicated things. Mind, I have made a shortgown, which is basically the same thing, only, well, shorter. But I’m rambling. Recently I was invited to attend a small event at a local museum, and though I could have whipped up a petticoat to use with said shortgown, I really wanted a dress. I had a cotton fabric with an almost handwoven look to it that I wanted to use. That would work well, as I wanted to portray the housekeeper of the middle class house we were to be in. 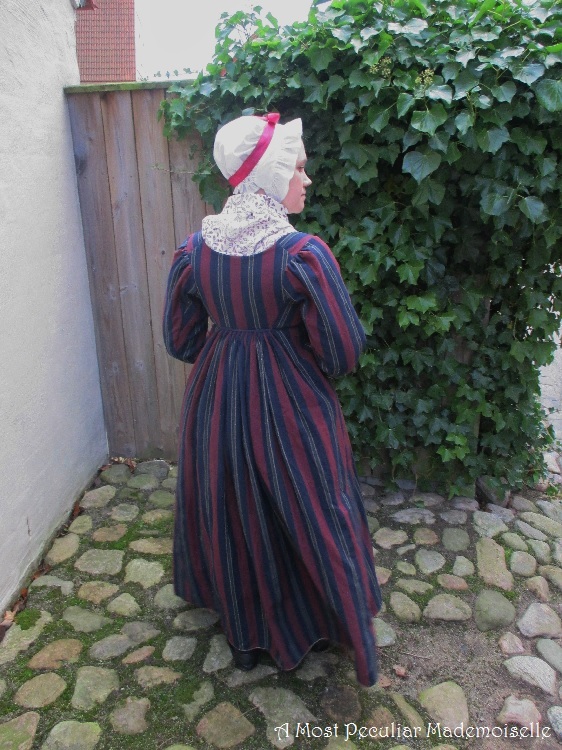 The stripes reminded me of the ones in ordinary Swedish women’s extant dresses from the period. They were quite often made from linen/wool, but cotton is also represented. Just two problems: the fabric only measured 150×210 cm, and I only had one week in which to make the dress. That’s one week where cutting, fitting and sewing had to be completed around all the things stay at home parents of little children do. Naturally I hand sewed the dress, using waxed linen thread (unbleached where it wouldn’t show, and brown for the rest) and period stitches. 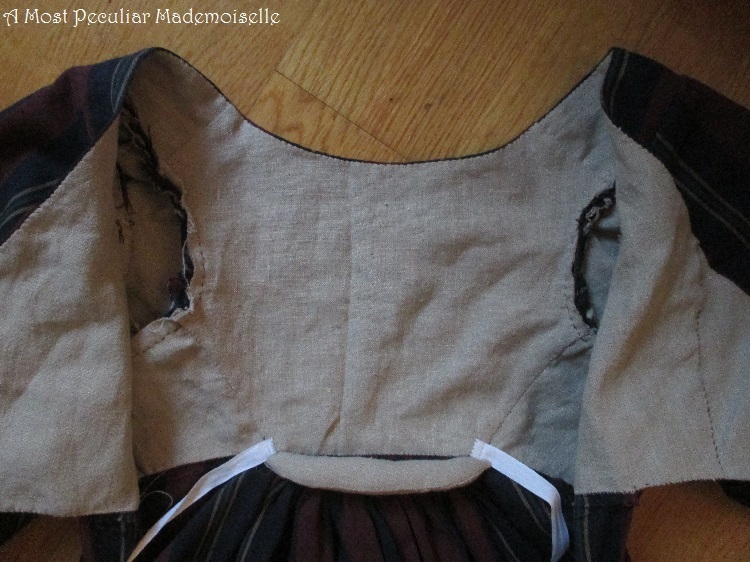 I lined the bodice and sleeves of the dress with unbleached linen. I might not have lined the sleeves had not all that piecing in them needed some protection from wear. I did my best to make the direction of the stripes follow the bodice as seen in extant dresses, and am rather happy with how it came out. 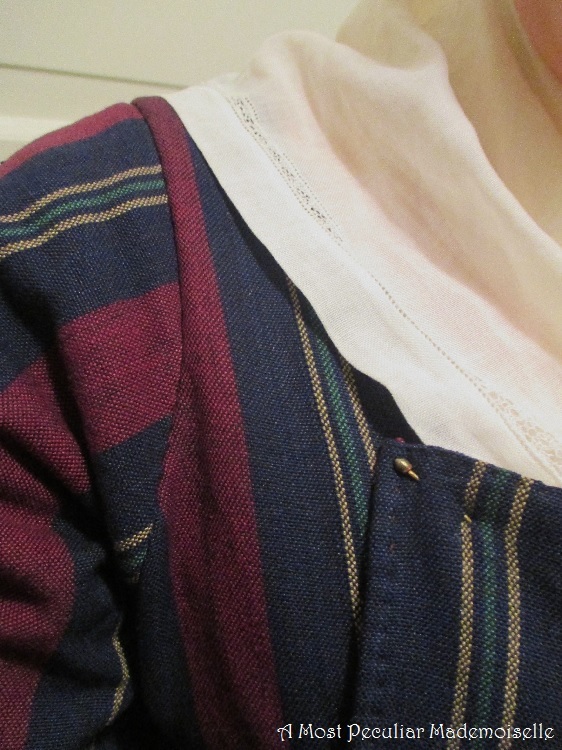 The bib is pinned in place with reproduction brass pins. I put a pleat near each end of the bib to make it shape itself around the bust nicely. I still haven’t decided if I’ll stitch them down to make darts or leave them as they are. The sleeves are pleated at the back of the shoulders, and are full enough at the wrists to pull on without any closures. 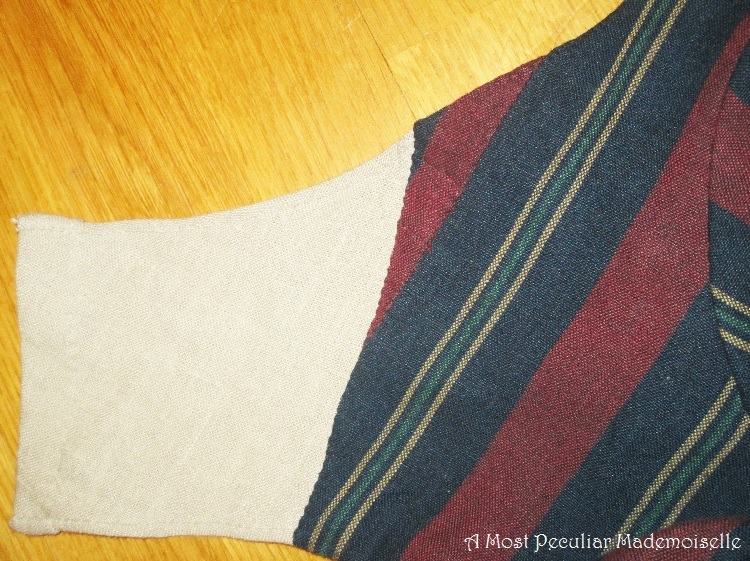 A tuck at the elbow (seen above in the picture of the piecing) provide a little extra room for movement. 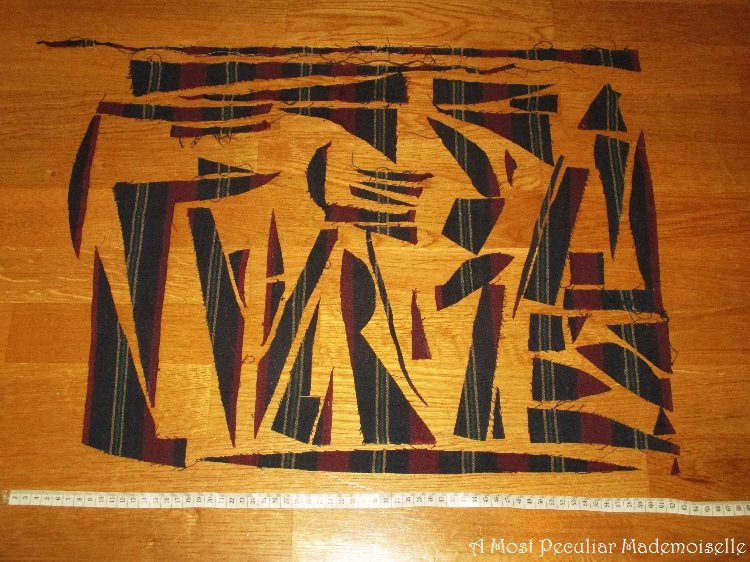 The bias strips are decorative, but their primary function is adding well needed length. The sleeves are still slightly too short, but they will do. 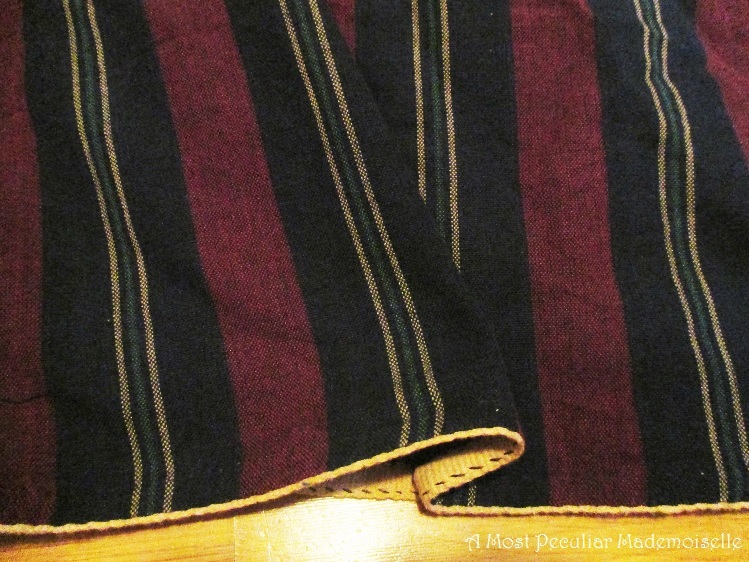 The skirt is smooth in front, and the ties on the front part of the skirt runs through stitched bars by the back seams, and then ties in front, under the skirt. The skirt is cartridge pleated in the back. 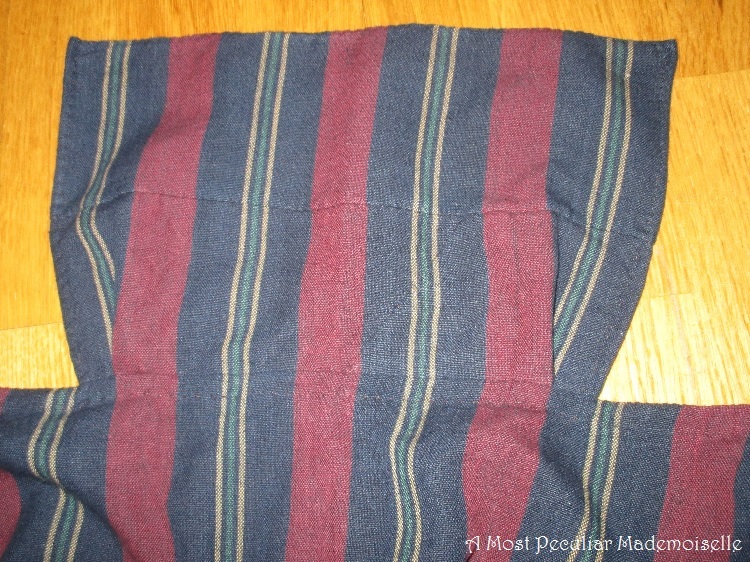 A small pad prevents the skirt falling in at the small of my back, and also supports the ties of the skirt front and any apron that might be worn. I added tapes to the inside of the bodice back to tie in the front, as I didn’t think the bodice lining did a good enough job to keep the bodice back tight to the body. The fine white cotton ties are too fine for this kind of dress – it was still a rather fancy material here in Sweden – but it’s what I had at hand. At least they won’t show. I faced the skirt hem with a cotton/linen tape I wove a couple of years ago – facings are brilliant when you don’t really have any skirt length to sacrifice on hems, and it’s a period way to finish them. 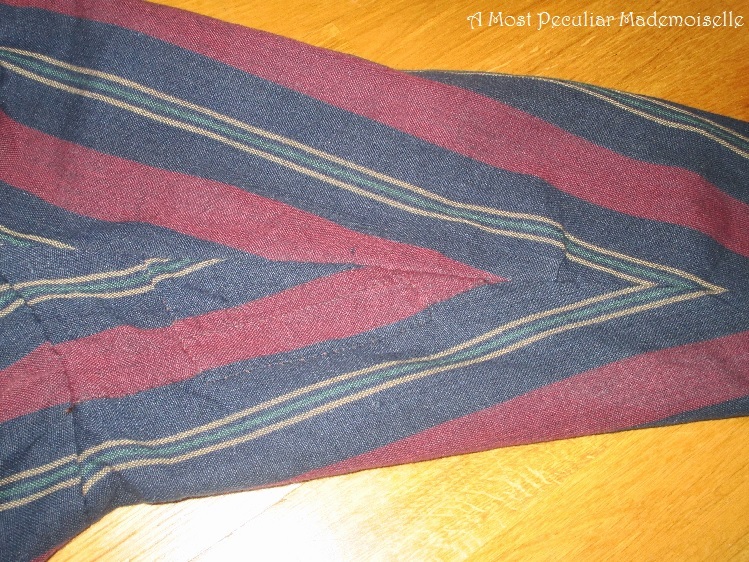 The tape too is pieced – it was initially used as 18thcentury style ties in a hobbit skirt, and are in four pieces. In the end I managed to get the dress wearable in time for the event, if not completely finished, hence the mitts in some of the pictures – the sleeves were not yet hemmed. Now however, it’s all done! I really like how it came out, and enjoy wearing it. Now I’m really keen to make more Empire dresses. 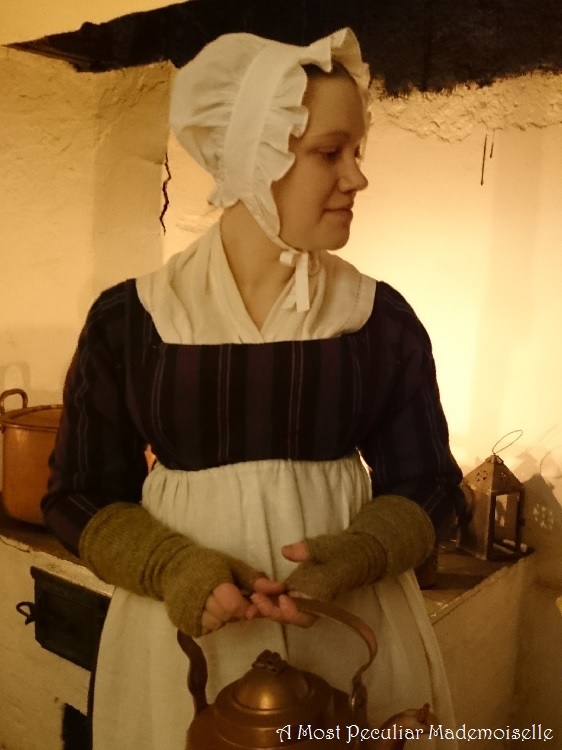 The pictures with the mitts are from the event at the museum, the ones without were taken today, when the weather finally allowed me to document the finished dress. I haven’t had time to participate in the HSM for a while, but this dress fit the last challenge of the year. What Challange/s are you re-doing? :# 2 Blue (the dress has a lot of blue in it), # 3 Stashbusting (everything came from my stash), # 5 Practicality (it is very much a dress to work in), #6 Out of Your Comfort Zone (first time making a dress of this period), # 10 Sewing Secrets (lots of almost invisible piecing). Fabric: Rather heavy weight, plain weave cotton and linen. Notions: Two kinds of linen thread, three kinds of cotton or cotton/linen tape, cotton batting. How historically accurate is it?Pretty much. Materials, pattern and sewing is rather good. Hours to complete: Difficult to say… estimated somewhere between 25-30 – the piecing took quite a bit of time to get nice. First worn: For a small museum event last Saturday. Total cost: Nothing at this time, as everything came from my stash. The main fabric and the brown linen sewing thread were originally a gift, the linen fabric was left over from a previous project, and two of the tapes were recycled from other clothes. I love this so much! It is so charming and I love all the details like the hand woven tape facing. And very impressive use of the fabric! Den är fantastiskt fin! Och silhuetten känns helt rätt. Brilliantly done. So glad you chose to do the housekeeper! Everyone usually wants to be the lady of the manor. Especially love the photo of leftover fragments. Fabric was not wasted! One of the best posts I've seen on getting into the period mindset. Thanks so much for your account. I really love your approach to this dress. Working with such an amount of yardage mirrows the challenge our ancestors have been facing about two hundred years ago. 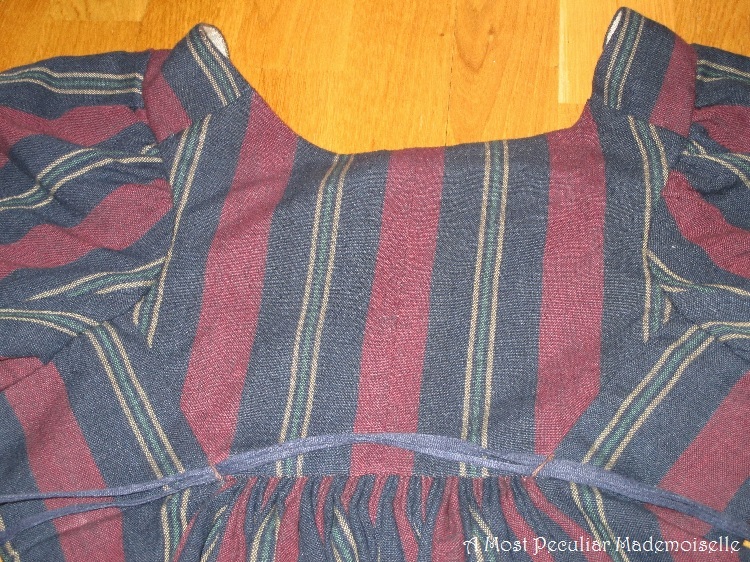 The width of fabric was often much smaller than today and there was a lot of piecing, same goes for dresses, which were made out of old dresses. To cut a long story short, your result is simply awsome as it catches the spirit of those bygone times. The fabric choice is great and I love how you added the accessories to the whole ensemble. 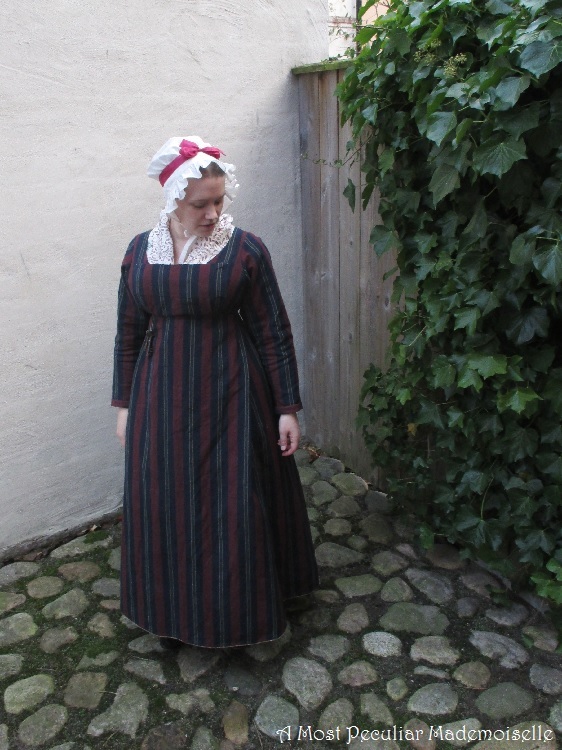 So your first early 19th century dress: a big success! Vad fin den blev! Ränderna ger den ju lite extra känsla också, fast bäst gillar jag alla skarvar! Thank you all ^_^ I feel most comfortable and “at home” when doing lower class impressions, even though it's fun to be a pretty princess (or at least a middle class lady) once in a while. And though I don't enjoy the piecing process very much, I do like the finished look it gives. 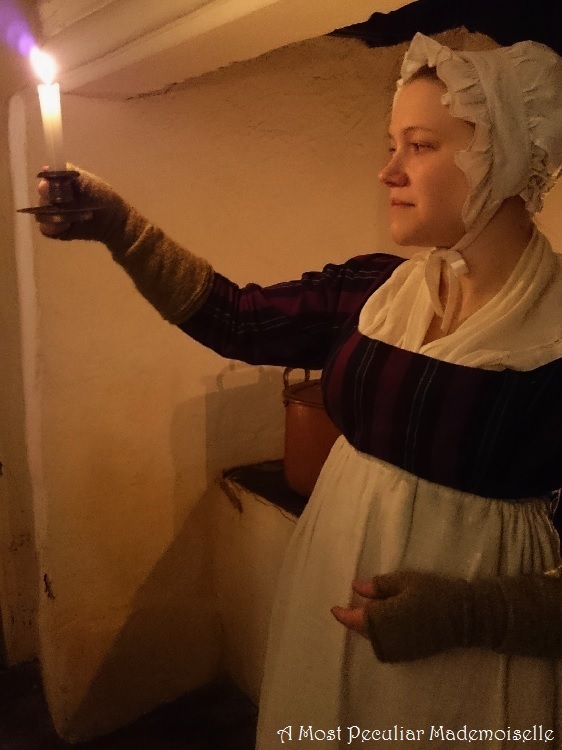 Thank you for your article, I also portray a 1810 Housewife and play in a Scandanavian music group. I need all the help pulling my clothing together I can get. I like the comment about it being comfortable to work in. That's important. Ooh, nice to see it finished! And it was very educational for the visitors to see two different social classes, I think. So, so lovely! I like the fabric choice so much and the piecing is terrific. You also look very nice in early 19th century styles. You look perfect! Oh, my word. You've done it again! I'm so, so impressed with the piecing. I really had to search to even spot the seams in the photographs. I love it! So pretty! I love how the back looks… often when I see the backs of Regency dresses, it is enough to make me really, really wish I could make them now. Hej. Hur gjorde du kjolen och “haklappen”? Jag försöker räkna ut hur jag ska göra för att få framsidan på kjolen slät och ha “drop front”. Jag har gjort kjolens framstycke sneddat i sidorna, så att den passar precis så långt som jag vill ha det i “midjan”, inga veck alltså. Kjolens bakstycke är en rak våd. Där de sys ihop i sidan så har jag lämnat det öppet en 15-20 cm högst upp, för att komma i och ur.